Pinterest is an outstanding tool for promoting products and services. It enables users to pin images from anywhere on the internet, making it ideal for those in the retail, fashion, and food and beverage industries to feature products and direct traffic their website. In addition, Pinterest’s ability to follow certain boards allows businesses to segregate content that represents different facets of the organization to provide a better user experience. Another added benefit is that the life span of content posted to Pinterest is significantly longer than that for the other major social networks. The task is determining what content will attract followers and elicit engagement. Pinterest data analysis tools are available to help users improve the performance of their profile and boards. It provides data on the most popular pins and how much traffic is generated when a pin is added. The analytics are divided into 3 segments: Profile, Audience and Activity. The Profile section displays the 50 pins and 20 boards with the highest number of clicks. Users will also find the number of repins, impressions and likes. Under audience, demographics are shown, including gender, and location. There is also an interests tab that shows what people are talking about and searching for.This information can be inclusive of the entire audience or filtered for followers. 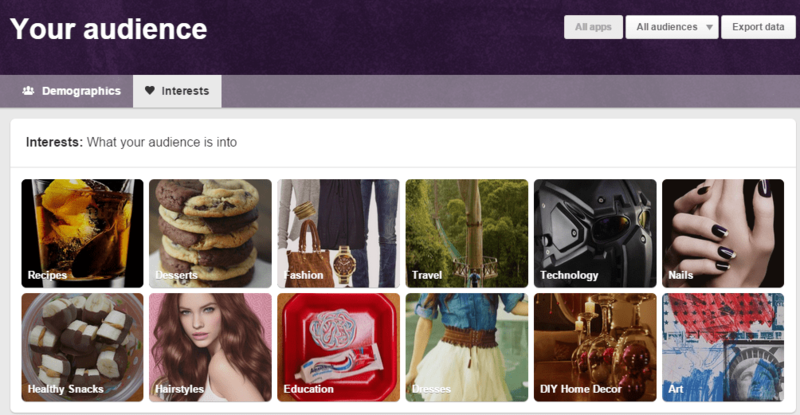 The Activity section provides Pinterest stats for original pins, all time and pin-it button. All three sections include tips customized for your page. Several third party companies offer more comprehensive Pinterest analysis tools. Percolate, for instance, offers integrated marketing solutions tailored to the needs of the organization. It incorporates all facets of the marketing process into its technology to improve efficiency and validate that each is congruent with the organization’s goals. The application helps improve productivity by delivering content to Pinterest e-mail, and other websites. Percolate makes pertinent recommendations to provide inspiration for the development of content strategies based on current trends on Pinterest. Pinterest statistics are provided to enable the organization to gauge their performance and determine areas that need improvement. Radian6 is a listening tool that tracks conversations on social media sites, blogs and a multitude of other websites. It has the ability to eliminate insignificant data arising from spam to deliver meaningful statistics that help businesses evaluate engagement and sentiment. Users can view reports on a dashboard that provides demographics, influential contributors, the number of times the brand was mentioned and the sentiment. The application can be integrated with other Pinterest analytics tools. Hootsuite provides a listening tool as well as an integrated Pinterest page analysis tool. The listening tool is capable of listening in multiple languages and tracking location. Hootsuite also enables users to analyze keywords to keep abreast of developing trends. Hootsuite’s Business Insights displays Pinterest follower growth and allows users to compare the number of followers on multiple boards. The ten top Pinterest posts are analyzed for likes, repins and comments. Unmeric performs analytics on their client’s Pinterest posts as well as those of top performing brands. This provides a Pinterest data benchmark tool that will enable clients to determine the type of content that will attract followers and engage their audience in relevant discussions. Unmeric’s tools display examples to help businesses improve their content strategy. It also provides notification when trending discussions develop. Pinterest data benchmarking can help businesses keep an eye on competitors in the same industry and draw inspiration from brands in other industries. For example, the Kraft Recipe Contest that allowed users to pin recipes to Pinterst boards for a chance to win a cash prize, attracted visitors and increased followers. The data generated from this campaign can be used as a Pinterest data benchmark, and the campaign itself can provide inspiration for other businesses to plan and execute marketing campaigns. Easily keep an eye on the engagement your competitors receive. Detailed Pinterest analysis performed by a third party is typically intended for use by large organizations. Pinterest engagement metrics for both the client and competitors allow clients to gain an understanding of the type of content that generates a successful campaign. They can use the data as a benchmarking tool as well as draw inspiration from the content strategy. This enables them to improve their own marketing to remain competitive.